New Swarovski Model? Goo Hara has presence at the Swarovski and ‘House of Hello Kitty’ Event! I’ve been seeing more on the internet about Goo Hara and Swarovski, but I still was uncertain as to how much is truth and just how much is rumor. We all know who Swarovski is and all the history of the Swarovski crystal brand. But how many USA Swarovski collectors know who Goo Hara is? Goo Hara is from South Korea. She’s 20 years old. She is a singer in a group called Kara. And now, it seems that she may be a model for Swarovski! Information obtained on the internet indicated she participated in photo shoots and was well-liked by Swarovski. Since Swarovski has NOT made any official press release, I don’t have any other details on the veracity. Along with a number of other Japanese celebrities, Goo Hara did attend the event in Japan “Swarovski presents ‘House of Hello Kitty’ held June 29. I saw video of Goo Hara posing with the Swarovski Hello Kitty purse launching very soon at the Swarovski and Hello Kitty. The Swarovski and ‘House of Hello Kitty’ event runs June 30 to July 10, 2011 at Omotesandou Hills in Japan. Attendees have the option to purchase 31 Swarovski Hello Kitty goods directly. Proceeds from purchases at this event go to the Japanese Red Cross for the earthquake relief fund. If the Goo Hara – Swarovski relationship is true, she may be appearing in our Swarovski crystal quarterly magazines soon! In 1988 the International Winter Olympics were held in Calgary, Canada. Swarovski Canada officially licensed at least 2 Swarovski crystal plaques to commemorate the event. I have heard rumors about a plaque with bears and a flag being previously discovered, but there was no year on the plaque. The Swarovski plaques are not marked with a Swarovski logo on the crystal, so finding a rare one with a Swarovski box was a real treat. The Saddledome plaque was numbered 9503M2692, and officially referred to by Swarovski as Saddledome, Iceberg. Unfortunately, the original box for the rare plaque featuring the bears hoisting the Canadian flag has been lost. The Saddledome Iceburg can be found in Warners Blue Ribbon Books Beyond Silver Crystal as well as the plaque with bears using the Warner’s assigned product number of BSC201000007. The bears plaque itself is very interesting, with Calgary, 1988, Winter Olympic Games, in English and French, engraved. The same blank crystal plaque was used for both Olympic memorabilia. It has physical size of 3 3/4″ wide and 3″ high. These plaques indeed are rare Swarovski crystal plaques to find. 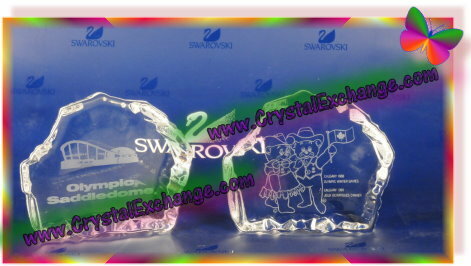 They may also be sought after by avid Swarovski crystal collectors, Canadians, or any participating Olympic athlete. Thank you to our Swarovski fanatics friends for passing along the information for us to share with crystal collectors around the world! Great news for our Swarovski crystal fanatics friends…we’ve received more credible news, from an authorized retailer web site, about the Swarovski Crystal 2011 Lovlots figurines soon to be released! Swarovski Anna and Emma are mice. They are just like the Joe and Harry mice, but have fuschia accents. Joe and Harry are clear mice that were released in 2006. The system number for these Swarovski crystal figurines is 843090. At the moment, Swarovski Joe and Harry are current and the set retails for $53. The Swarovski system number for Anna and Emma mice is 1090726. Swarovski Coco is a small dog. Coco is blue in color. The system number for Swarovski Coco is 1089200. Swarovski Piggy Sue is….can you guess….a pig! Piggy Sue is dark pink, but is just like her clear counterpart, Piggy Pong. Piggy Pong was released in 2007 and is slated for release this year. Swarovski Piggy Pong sells for $55 and the system number is 894551. The system number for Swarovski Piggy Sue is 1090725. Swarovski Scottie is a green dog, likely a terrier. The system number for Swarovski Scottie is 1089199. I wonder if Coco and Scottie will be added to the Swarovski Gang of Dogs family in the Lovlots product line. If so, this group will be up to 7 dogs. Other Gang of Dogs figurines includes: Peppino, Salvatore, Tomaso, Tomasino, and Violetta. These new Swarovski Lovlots, Anna and Emma, Coco, Piggy Sue, and Scottie, will retail for $55 – $105 depending on the figurine. Retired and Limited Edition Lovlots can be found at the Crystal Exchange America web site, which can be found at www.crystalexchange.com . I’m looking forward to seeing these Lovlots Swarovski crystal figurines in the near future! Swarovski has put out a formal statement on their web site about the Swarovski Hello Kitty crystal collaboration this year. Hello Kitty was introduced in 1974 and has remained popular for over 25 years in pop, art, culture and fashion. And in 2011, Swarovski is joining in on the force through jewelry, charms and crystal figurines. 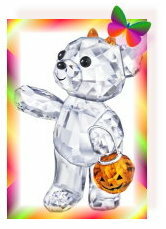 The Swarovski announcement indicates that there will be three Swarovski Hello Kitty crystal figurines. And last, but not least, a limited edition Swarovski Hello Kitty figurine decorated using the signature pointiage technique. This confirms the news we found earlier on the web that there will be only 88 pieces worldwide with nearly 20,000 Swarovski crystal stones. So, if you are a Hello Kitty fanatic, the release date is just around the corner. The official Swarovski Hello Kitty collection debut will be at the end of July…. only one more month of waiting. Happy Father’s Day to Swarovski collecting crystal fanatics around the world! May all Dads, Grandfathers, and Fathers-to-be have a relaxing and enjoyable day! I recently found this cute story and thought today was an ideal day to remember the simplicity of our kids life and how fortunate we are to have parents to teach us the way, and kids to remind us how wonderful life is…. Father’s Day was near when I brought my three-year-old son, Luke, to the card store. Inside, I showed him the cards for dads and told him to pick one. The original MSRP of the Swarovski Porsche cars was $270 – $650 depending on the exact car model. All are considered limited editions. Some are numbered. Some have a production maximum. Some were produced or sold for just a year or two. I did not find any new Swarovski Porsche cars after 2007. 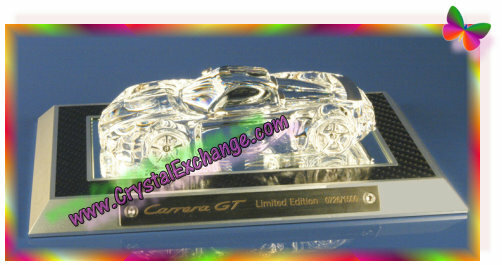 If you are are looking for a Swarovski Crystal Porsche, Crystal Exchange America does have a big selection of them available. Interested Swarovski collectors can visit the Crystal Exchange America web site at www.CrystalExchange.com and view the ‘Transportation’ category or search for the term ‘Porsche’ in the search box. Swarovski Voucher issued for 10 year celebration! This morning I received a Swarovski voucher code to celebrate the 10 year anniversary of the Swarovski online shoppe. The voucher is good only June 10 to June 20, 2011. This Swarovski discount can be redeemed for a 10% credit toward a Swarovski crystal purchase exceeding $145. I would imagine that the voucher was sent to all those crystal fanatics that are Swarovski SCS members as well as those who are simply signed up to receive the Swarovski newsletter, but I cannot say for sure. Congratulations to Swarovski for 10 years of success!